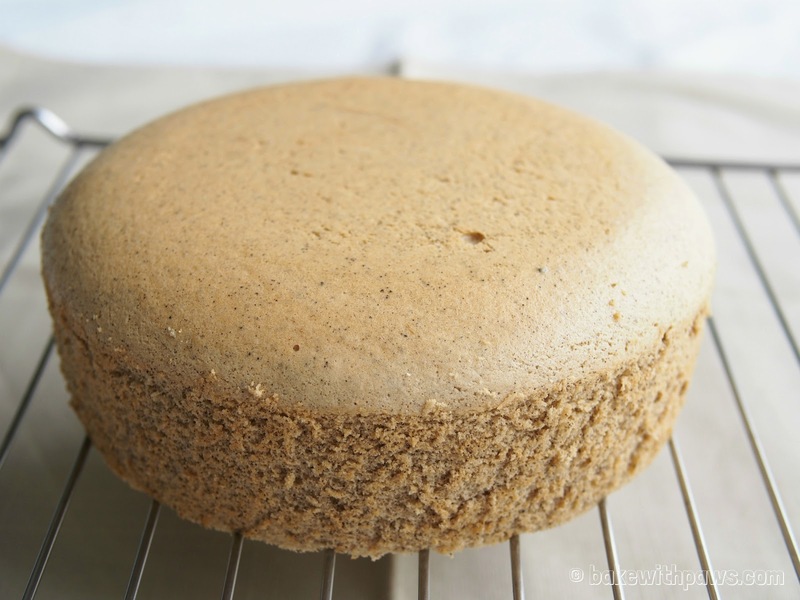 I received couple of enquiries for the recipe for the Earl Grey Chiffon Cake in a normal round pan. Below are the recipes for those interested. I am calling it Earl Grey Cotton Cake because it really is soft like cotton. Anyway, it is just a name and you may call it any other name as you like. This is actually the same recipe for Earl Grey Chiffon Cake that I shared before but with a different baking method. The original recipe was adapted from Jeannie Tay Blog. Utensil: 6 inch round cake pan (Line the bottom of the pan with grease-proof baking paper or parchment paper). Utensil: 7 inch round cake pan (Line the bottom of the pan with grease-proof baking paper or parchment paper). Infuse 1 tea bag of earl grey with 110ml hot water. Set aside to cool. Blend earl grey tea leaves of 3 tea bags in the blender for few seconds. Sift flour and baking powder. Add salt and blended earl grey tea. Mix well and set aside. Beat the egg yolks, 20g sugar and vegetable oil with a hand whisk till sugar dissolves. Add in cooled earl grey tea and combine well. Add flour mixture in three batches into the egg yolk mixture. Mix well and set aside. Use a large clean bowl, making sure there’s no water, egg yolk or oil in it. Beat the egg whites with an electric mixer until bubbles form. Add the cream of tartar. After mixing well, add the 60 grams of sugar gradually until stiff peaks form. Spoon out 1/3 of the meringue and fold into the egg mixture. Lightly fold in the rest of the meringue with a spatula, until just combined. Pour into a prepared cake pan and tap tin lightly to remove air bubbles. Baked in water bath at 170C for 30 to 35 minutes. Then another 40 minutes at 150C.